There will be s’mores on a camping trip, that much we know. 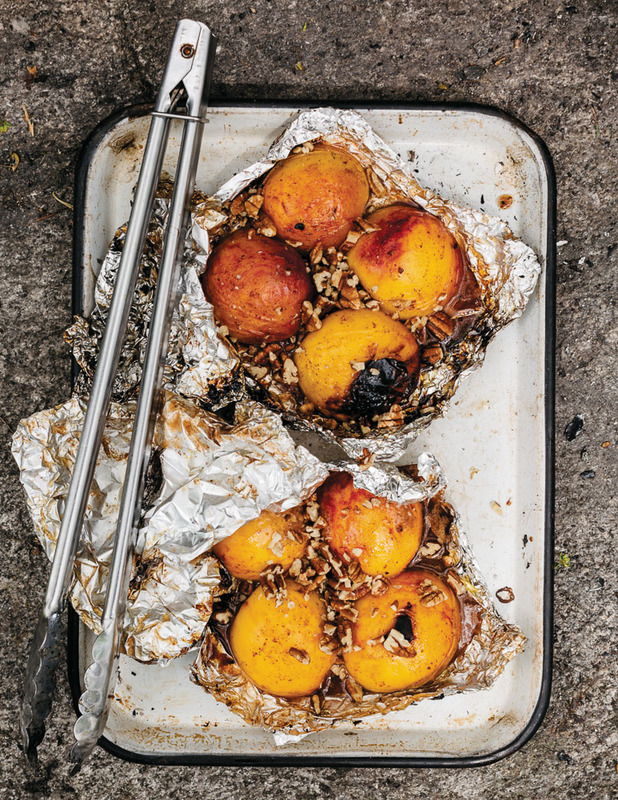 But on the off chance that people want to try something else for dessert , these peaches, roasted in a foil packet, are the answer to toasted marshmallow fatigue (if that’s even a thing). Recipe inspired by Aimee Borque at simplebites.net. DO AHEAD: Mash the butter, honey, sugar, spices and salt together in a small bowl until fully combined. Transfer to a lidded container and store in the fridge until ready to pack the cooler. Toast, cool and chop the nuts. Store in a small container or resealable bag. AT THE CAMPSITE: Light a fire and let the wood burn until it’s white-hot (but not blazing). Bring the honey butter out of the cooler to soften. Make four 8-inch squares of foil and smear 1 tablespoon of the butter in the center of each square. Slice peaches in half, remove their pits, and place pit-side-down in the center of 2 foil squares. Dab remaining butter over the tops of the fruit, then top each with another foil square and fold up the sides of the foil to seal into two packets. Place in the hot coals and bake for anywhere between 5 and 15 minutes, depending on the hotness of your fire. Remove from coals, unwrap the peaches and transfer to plates, spooning some of the cooking liquid over the fruit. Sprinkle with chopped nuts and serve.